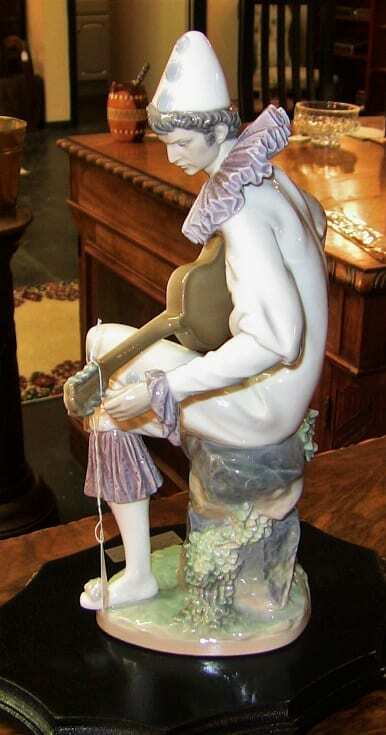 Lladro Retired Serious Clown with Guitar by Salvador Furio. 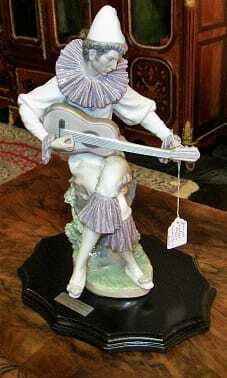 STUNNING AND RARE Lladro retired Serious Clown with Guitar by Salvador Furio. Lladro is a fine hard paste porcelain made in Valencia, Spain and the production method is a highly prized secret.....not unlike Col. Saunder's Recipe !! Lladro is WORLD FAMOUS for producing some of the finest and most collectible porcelain currently being made anywhere in the World. 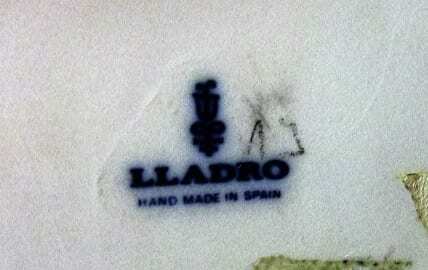 Collectors of Lladro are counted in their Millions !! 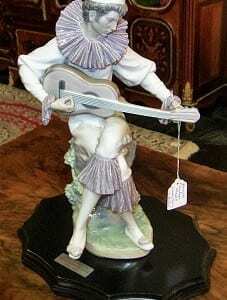 This is titled "Serious Clown with Guitar' and was sculpted by Salvador Furio. It began production in 1974 and was retired in 1979...........thus making it VERY RARE AND HIGHLY COLLECTIBLE !! This is an early piece from circa 1975................the collector who we bought these from collected most of her extensive Lladro Collection in the mid-1970's and early 1980's. It bears a number 232 and initials MM..................it is also hand-initalled by the artist.....Mr. Furio. 'Serious Clown with Guitar' depicts a seated Clown in his Clown uniform playing the Guitar. He got his name as 'The Serious Clown' because he does not possess very 'clown type features'. He has an intense stare as he is engrossed in the playing of his guitar. He clown uniform is simple and understated......no red noses here !!! He sits on a moss covered plinth with creeping ivy. It is fully marked and in MINT CONDITION ! It sits on a later black lacquer plinth with silver label. You cannot buy this anymore ......this is your chance !!!!! A TRULY EXCEPTIONAL PIECE !! 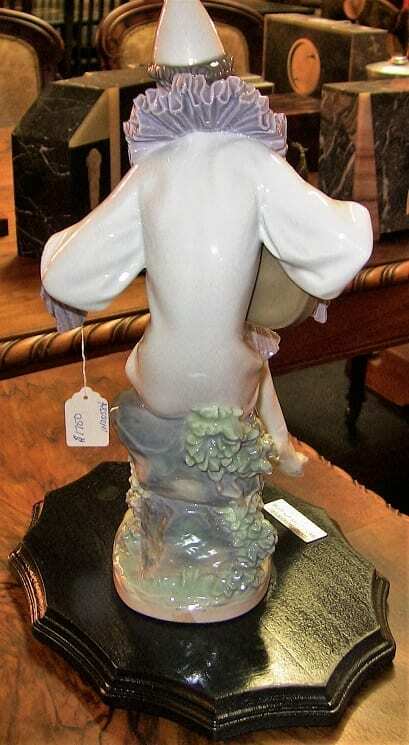 If you are a collector of Lladro then this is a 'MUST HAVE' ! 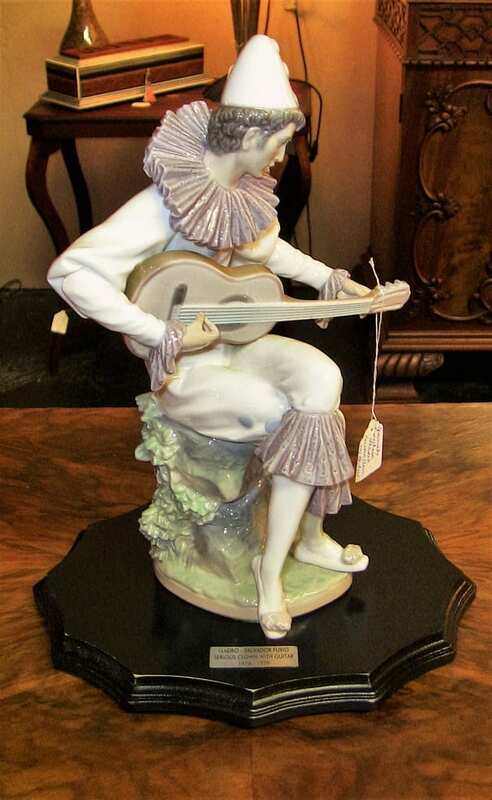 Lladro Retired Serious Clown with Guitar.